Today is Mother’s day, and all around the world grateful sons and daughters are bestowing love and gifts upon the most important person in the family — Mom. How many pounds of candy, how many kisses and hugs, how many long-distance phone calls, how many bouquets of roses, and how many Hallmark cards will bring smiles and tears of joy all around the globe today? I don’t think I can count that high — math was never my strong suit. Mother’s Day is a tough time to be without a mom and without a job. Because just when I need a hug the most from the person who truly loves me more than any other person ever could, it turns out I’m out of luck. My mother passed away about three years ago, but if she were alive today, we’d certainly be celebrating together. We’d gather the family at my house early in the day. We’d open lots of little presents, each with a different card, some funny, some sentimental. My sister and I would plan a big dinner, maybe something on the barbecue, weather permitting, and we’d all clink our wine glasses together to toast one of God’s greatest ideas: the mom. At the end of the celebration, I’d send Mom home with leftovers and goodies to last a week. It’s a little something I learned at her side, watching her through the years, and through the hours and hours of pleasure she got just by being in her kitchen. My mom thought it more important that food be good, not necessarily good for you. So, her recipe file leaned toward the fattening, the rich, the divine. If you’re going to make a cake, then really make a cake — or a pie or cookies or a lasagna — and don’t cut corners or try to save calories with substitutions. Man the cookie sheets, bring the butter and eggs to room temperature, and make no apologies. That was her logic. And it worked. Her desserts, if I may be so bold, were legendary. If not to the whole world, at least to her friends and family who treasured them so. But she was a stickler for the rules — when it came to recipes, that is. We used to watch the Food Network together, and if I saw something that looked good and I began to make minor comments such as, “That would be better with ground turkey,” or “I think I would use red bell pepper there instead of green bell pepper,” it would set her off. She’d immediately get her hackles up, as if I were launching some personal attack on her. “You just can’t leave well enough alone, can you?” she’d ask, actually making it sound more like the discovery of a personality flaw than a question. I can’t help it and I don’t know where it came from, but I’ve always wanted to tweak recipes a bit, to add a little something-something to make them tangier, cheesier, sweeter, bolder, crunchier, etc; to make it more me. And she hated that. She would implore me, almost scold me, to make the recipe exactly as written the first time around, then, if I wanted to add something or put a different spin on it, I could tweak it my way the next time. It was one of her biggest pet peeves. I miss the opportunity to once more tease her about a new recipe I’d like to change, just to see her jaw drop and her eyes widen, to hear her groan my name once more, to see her shake her head and hand at me as if she were about to send me to my room. Who knew those would be the moments I’d miss? Fully engulfed in personal crisis as I am right now, and missing my mother on this Mother’s Day, I found myself drawn to the kitchen and to the recipes of my youth, channeling my mother in some odd cosmic way, and recreating a recipe I’ve had a gazillion times. A simple casserole dish. My mother found the recipe in a cookbook of “health food” dishes back in the late 1950s, and it quickly became my favorite. In fact, that’s all we’ve ever called it. I don’t think our family even knew the original name of the recipe. It simply became “my favorite casserole.” And whenever we referred to it, which was often, that’s what we called it. It was always my go-to choice for my birthday dinner, or when I was sick, or during the rush of the holiday season, and many other occasions in between. Originally, this recipe called for a sprinkling of wheat germ over the top before baking, but I don’t imagine my mother ever had any wheat germ in her cupboard nor did she have any desire to start stocking it. She quietly omitted that ingredient and we never missed it. These days, my favorite casserole isn’t anything I’d order off a menu when dining out, but that’s OK. It still serves its purpose as a bonafide, tangible, comforting connection to the wonderful childhood I was privileged to live. If ever I want to transport myself back in time, I need only assemble this casserole, smell this casserole baking, taste the mother’s love within this casserole to soothe my longing heart. It’s almost as good as going home again. Almost. This casserole isn’t glamorous or provocative. It isn’t new, nor could it ever be considered gourmet. Instead, it is comforting and filling, satisfying and easy. And, with a tantalizing combination of comfort foods that every youngster craves, it is kid friendly. Ground beef, cheese, creamed corn, tomato soup, and noodles party together in a big pot to create a creamy, cheesy goodness with the underlying flavor of a mother’s love. Serve it with hot, buttery garlic bread and a simple green salad, or alongside corn chips and fresh fruit for a meal that’s a little more casual. In other words, feel free to tweak it to suit your taste buds. Mom and I won’t mind. Preheat oven to 350 degrees. In a large heavy pot or dutch oven over medium-high heat, brown ground beef in one tablespoon olive oil and sprinkle with a little salt and pepper and the basil. Add the chopped onions and garlic and cook a few minutes to soften the vegetables. Add the canned tomatoes, soup, one can of water, and the creamed corn. Sprinkle a little more salt over the mixture and stir together. Add the noodles and cook for about seven minutes or so; you don’t want to overcook the noodles now because they will cook further in the oven. After the noodles are almost cooked through (al dente), pour half of the mixture into a casserole dish, sprinkle with half the cheese and pour the rest of the mixture over the cheese. Sprinkle the remaining cheese over the top of the casserole and bake for approximately 20 to 30 minutes or until the cheese is melted and the mixture is heated through and bubbling around the edges. Remove from the oven and let stand for at least 10 minutes before serving. Yum! 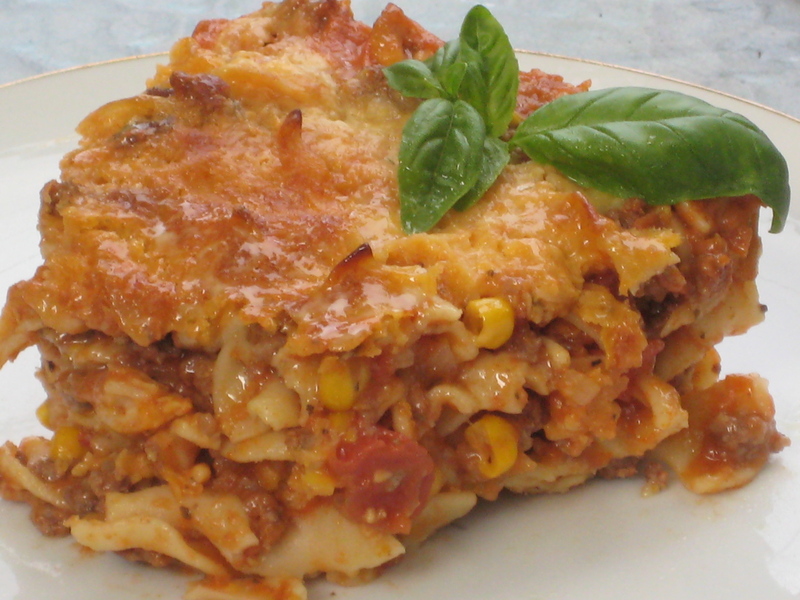 This entry was posted in Comfort Food -- Savory, Entrees and tagged casserole, cheese, comfort food, ground beef. Bookmark the permalink. It is my goal this weekend to catch up on your blog. I love the sandwich piece and how you referred to your grandma. That was so sweet. I am going to print it out for my mom, I think it is easier than trying to get her to find it on the internet. Thank you so much! There won’t be a quiz, but I sure appreciate you catching up on the posts anyway. Come back again. What a yummy looking recipe! 🙂 I love the fact that all the ingredients are pretty easy to find! No strange-sounding spices or anything too off-the-beaten-path! Thanks for sharing…can’t wait to try it!!!!! !